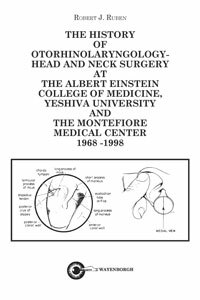 When I arrived at Montefiore / Einstein in May 1999, I inherited a department that Dr. Robert Ruben had put on the otolaryngology map as research powerhouse. When I was a student at Tufts Medical School, I had spent a summer doing research on the effect of radiation on canine gastric mucosa at Einstein under the mentorship of Dr. Herzel Raggins. I was introduced to the school and the department of surgery and was duly impressed. Years later, I left Harvard as Chief of Otolaryngology at the Brigham and Women’s Hospital and Beth Israel Medical Center and as Program Director of the ORL residency to become Chair of the ORL-HNS Department at Montefiore / Einstein. My goal was to build an outstanding resident training program in New York City and strengthen the clinical breadth and depth of my new department. I think, with the help of Dr. Ruben and many colleagues, we have achieved both, while still keeping focus on research. It was nearly a decade ago, that I asked Dr. Ruben to compile a ‘brief’ history of the department while he was chairman. Periodically, I would ask him how it was coming along, and he would reply ‘I am working on it’. Needless to say he was. I have never seen Dr. Ruben at a meeting without is trustworthy notebook. The kind of notebook that is bound, as in elementary school, with a hard black and white cover and with pages that could not easily be torn out. I have wondered what he did with all of those books. Now that he has compiled a detailed history of ORL-HNS at Montefiore / Einstein, I know where the information has come from. His meticulous note taking has been the source material for this book. I am forever grateful to Dr. Ruben, who has stayed on as faculty member in our department to this date, for his unwavering support of me and our efforts to continue to grow as an academic center. The administration of Montefiore and particularly our President, Dr. Steven Safyer, has been visionary and shared in our goals. Dr. Allen Spiegel, the Dean of Einstein, one of the physicians who, I believe, remembers everything he has read, has supported the department all along the way. And to the faculty and residents who carry on our heritage as so well documented in this volume, thank you.